Temporary bridges will keep traffic flowing and improve work zone safety for the Wisconsin Department of Transportation as it replaces three two-lane bridges on Wisconsin 25 near the town of Nelson. A fourth bridge is being widened in the $12.97 million project, which received a $1 million Highways for LIFE grant for its use of innovation and performance goals. The highway connects Wisconsin to Minnesota through the Nelson-Trevino Bottoms State Natural Area. "Our major performance goal was to have just three months of signalized one-lane traffic, compared to the 18 months (of signalized traffic) it would take to build the bridges one lane at a time," said Paul L. Conlin, project development supervisor for WisDOT. Conventional practice calls for the contractor to close one lane of the existing bridges and replace that lane while traffic uses the other lane. That method would require two nine-month construction seasons, working on two bridges per season, to complete the four bridges. Instead, Lunda Construction Co. of Black River Falls, Wis., will build temporary bridges and bypasses to route traffic around the new bridges being built. Construction, which began in September 2009, will take just 11 months, not 18, and will be completed by December 2010. New construction is shut down for four winter months. The project will replace the first bridge, a 124-foot (37.7-meter) single-span steel pony truss bridge. It will require a temporary bypass bridge to handle traffic during construction. The second bridge, just 26.5 feet (8 meters) wide, was widened last fall to 44 feet (13.4 meters), which required signalized one-lane traffic for three months. The other two bridges are eight-span, 543-foot-long (165.5-meter-long) prestressed concrete girder bridges that are structurally deficient. Those two bridges will be replaced with precast girder bridges with high-performance concrete in the decks for longer life. The use of open pile bents on the new bridges will help reduce environmental impact on the causeway. Because the piles will not have concrete cast around them, they can serve as a fish habitat. The conventional bridge construction technique used in Wisconsin is a pier-type construction, meaning that the top of the piles are below grade and a footing is cast on top of them. A column or pier extends upward from the footing to support the beam seat. The new bridge decks will not have longitudinal construction joints because the decks can be cast in one monolithic concrete pour across both lanes and shoulders. With the conventional practice of placing one-half of a bridge at one time, traffic using the half of the bridge built in the first stage causes vibrations along the reinforcing steel into the freshly placed concrete. Temporary bypasses like this one will keep traffic flowing and remove construction workers from harm's way while new bridges are built on Wisconsin 25. "We moved the transverse expansion joints off the deck," said Conlin. 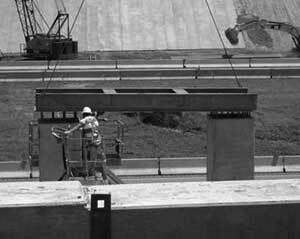 "They're near the end of the approach panel and that keeps water off the abutments to lengthen the life of the bridge. We're using a special approach panel that has not seen widespread use in Wisconsin." By constructing temporary bridges capable of carrying two-way traffic, WisDOT anticipates that user delay will be minimal. With conventional staged construction and use of traffic signals to control traffic across the bridges during construction, the optimal cycle length would be more than 12 minutes. But with temporary bridges, the traffic delay is predicted to be less than a minute. Conlin said that the contractor can choose the most economical type of temporary bridge structure that meets WisDOT specifications. The contractor is building temporary bridges consisting of precast concrete deck panels and open pile bents, in which the pilings are tied together above ground to form the beam seat. The use of temporary structures is not new, but the amount for this project—66,000 square feet (6,131 square meters)—is unusual. 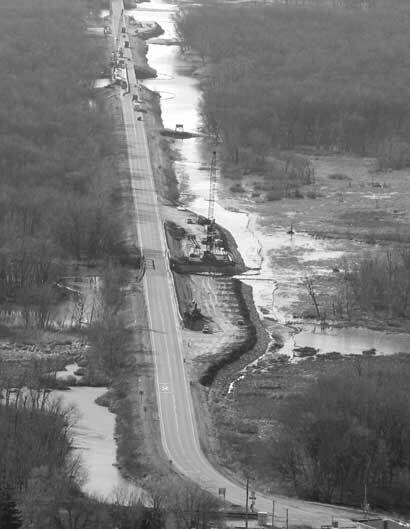 In its Highways for LIFE grant application, WisDOT said industry leaders indicated that using this quantity of temporary structures would stress the industry stockpile, but increasing that stockpile could lead to more use of temporary bridges in the future. For more information, contact Pete Garcia in the Federal Highway Administration Wisconsin Division at (608) 829-7513 or pete.garcia@dot.gov. Part of the second Strategic Highway Research Program focuses on renewing the nation's aging infrastructure in ways that minimize traffic disruption and produce long-lasting highways—goals shared by the Federal Highway Administration's Highways for LIFE program. The objective of SHRP 2 Renewal is to develop tools to "get in, get out and stay out" when rehabilitating highway infrastructure, and to achieve rapid renewal not just on isolated projects, but throughout the highway system. Highways for LIFE is designed to mainstream the use of proven innovations and performance goals to minimize congestion and enhance quality, safety and user satisfaction. "Both programs are about accelerating construction projects, minimizing disruption to motorists and building projects that last longer," said Mary Huie, Highways for LIFE program coordinator. Huie, who also serves as FHWA's coordinator for SHRP 2 Renewal implementation, works part-time at the Transportation Research Board's offices to stay current on SHRP 2 progress and advise TRB staff on related FHWA activities. The exchange will help move research results into practice when the program's implementation phase begins. Some of the 28 SHRP 2 Renewal projects involve research on technology, such as prefabricated and modular components, better and faster nondestructive testing, and high-speed construction inspection. Other research addresses integration of materials and technologies to build roads and bridges that are easier and less expensive to maintain. One barrier to innovation implementation is lack of guidance on using new technologies and techniques. Many of the products of the SHRP 2 Renewal effort will provide transportation agencies with standards, guides and best practices, Huie said. The goal of the SHRP 2 Renewal project on innovative bridge design is to mainstream accelerated bridge replacement methods. The focus is on developing standard approaches that streamline the process of getting bridge systems designed, procured, fabricated and installed. Activities include developing new designs, construction techniques, specifications and training materials. That goes hand in hand with the Highways for LIFE Vanguard Technology initiative to mainstream the use of prefabricated bridge elements and systems, Huie said. Prefabricated elements are built off-site or next to the work zone and moved into place for quick installation. As part of the effort to promote prefabricated bridge elements, Highways for LIFE is compiling existing specifications and plans into a comprehensive manual that highway agencies can use to accelerate bridge design and construction. "We're putting together existing technologies, while the SHRP 2 objective is to develop new methods and designs for prefabricated bridge construction, " Huie said. FHWA also offers showcases, workshops and a DVD toolkit and is developing a Web-based decision tool to assess the cost-effectiveness of using accelerated bridge construction. Another SHRP 2 Renewal project focuses on modular pavement technology, which uses precast segments that are transported to the work zone for quick repair of pavements. The goal is to develop tools to help highway agencies design, install and maintain modular pavement systems, including guidance, design criteria, project selection criteria and model specifications. In a related effort, Highways for LIFE is promoting the use of precast concrete pavement systems through its Vanguard Technology initiative. Among the tactics being used are demonstration projects and Web conferences that show how states are applying this technology to cut traffic congestion on projects and produce more durable pavements. Performance specifications for rapid highway renewal – This project is developing recommendations on using performance specifications, which define the results a project should achieve rather than specify how to build it. Another outcome will be guidance on how performance specifications can be used effectively in various contracting scenarios, such as design-build and warranties. Technologies for locating underground utilities to minimize delay in construction starts – This project is documenting technologies used to locate underground utilities, as well as identifying new and potential technologies for development. Its first report, Encouraging Innovation in Locating and Characterizing Underground Utilities (S2-R01-RW), is available at onlinepubs.trb.org/onlinepubs/shrp2/shrp2_S2-R01-RW.pdf. Geotechnical engineering to accelerate construction and reduce maintenance frequency – This project is aimed at finding ways to construct new embankments and roadways over unstable soils, widen existing roadways and embankments more rapidly, and improve the support beneath pavements. Among its objectives are developing design guidelines, test procedures for quality assurance and performance specifications. As SHRP 2 products are developed, FHWA will implement them in partnership with the American Association of State Highway and Transportation Officials, National Highway Traffic Safety Administration and TRB. Margie Sheriff is the director of FHWA's SHRP 2 implementation team. "We've been sharing the Highways for LIFE strategies on implementing technologies with the SHRP 2 team," said Huie. That includes the Vanguard Technology process, which combines dedicated teams, marketing techniques and designated funding to move technologies into mainstream use throughout the highway community. SHRP 2 team members also have attended the Highways for LIFE seminar "Leap Not Creep: Accelerating Innovation Implementation" (FHWA-NHI-134073). To learn more about SHRP 2 Renewal, visit http://www.trb.org/StrategicHighwayResearchProgram2SHRP2/Blank2.aspx. The Web page includes links to the SHRP 2 Renewal Research Plan and project database. The SHRP 2 team is seeking transportation agencies to participate in demonstration projects to test and validate the use of performance specifications for rapid highway renewal. For details, see onlinepubs.trb.org/onlinepubs/shrp2/R07Demonstration.pdf. For more information on SHRP 2 Renewal, contact Mary Huie at (202) 366-3039 or mary.huie@dot.gov, or Robert Raab at (202) 334-1430 or rraab@nas.edu. Congress established the second Strategic Highway Research Program to investigate the underlying causes of highway crashes and congestion in a six-year targeted research effort. Safety – Prevent or reduce the severity of highway crashes by understanding driver behavior. Renewal – Address the aging infrastructure through rapid design and construction methods that cause minimal disruption and produce lastingfacilities. Reliability – Reduce congestion through incident reduction, management, response and mitigation. Capacity – Integrate mobility, economic, environmental and community needs in planning and designing new transportation capacity. SHRP 2 is managed by the Transportation Research Board in cooperation with the Federal Highway Administration and the American Association of State Highway and Transportation Officials. Staff from the Transportation Research Board, District Department of Transportation and Federal Highway Administration attended a session of "Leap Not Creep"
Staff from the Transportation Research Board, District Department of Transportation and Federal Highway Administration attended a session of "Leap Not Creep: Accelerating Innovation Implementation" at Turner-Fairbank Highway Research Center in McLean, Va. 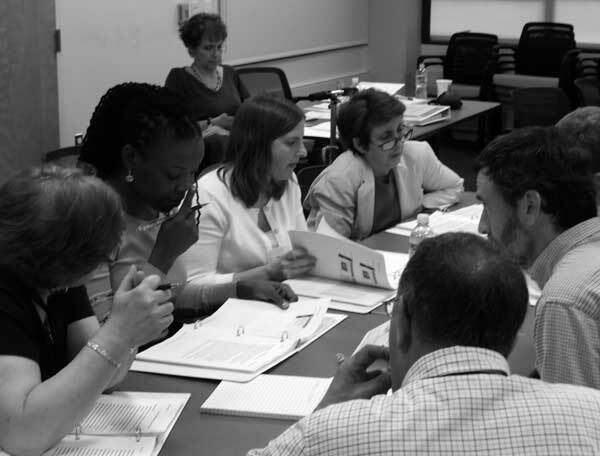 Developed by Highways for LIFE, the course (FHWA-NHI-134073 at http://www.nhi.fhwa.dot.gov/home.aspx) provides participants with tools and strategies to make innovation standard practice at highway agencies. For information, contact Julie Zirlin at (202) 366-9105 or Julie.Zirlin@dot.gov. A group cross–cutting session on "Nothing but Net: The Results of Applying Highways for LIFE Concepts to Highway Construction Projects" will cover how innovations were deployed to build projects in several states faster, more safely, less expensively and with less impact on motorists. It's scheduled for 10:15 a.m. to 12 noon on Jan. 13. Several innovations in concrete pavement design will be demonstrated at FM 1938, a 2-mile (3.2-kilometer) stretch of six-lane divided roadway scheduled for construction near Fort Worth, Texas. The project will relieve congestion in northeast Tarrant County by providing one section of a corridor from Interstate 820 to SH 114. The FM 1938 corridor will be an important north-south reliever route for motorists when the nearly $3 billion North Tarrant Express project begins in 2010–2011. "This FM 1938 project is on the cutting edge of green pavement design," said Ralph Browne, area engineer for the Texas Department of Transportation. "The project will demonstrate the correct methods to acquire improved durability and, by using less cement, it will reduce emissions released during cement production." For its innovations in construction, the $15.4 million project will receive a $1 million Highways for LIFE grant. Ed Bell Construction Co. of Dallas plans to start work in March 2010. One is optimized aggregate gradation in the concrete mixtures. Such mixtures are not gap-graded like conventional concrete, but are well-graded from the top size on down. That improves particle packing and reduces the amount of portland cement required, cutting costs and carbon dioxide emissions. A nonwoven geotextile bond breaker between the concrete and the road base will save the cost of the conventional hot-mix asphalt bond breaker now used in Texas. An intelligent compaction system for packing the base and subgrade will allow the equipment operator to determine in real time the optimum compaction level, which helps prevent pavement failures. Other innovations include a water-based lithium formulation for concrete curing and alternative texturing methods to control tire-pavement noise. The contractor will use three concrete mixture designs. One is the baseline design with conventional gap-graded aggregates. The second is a three-aggregate blend—one fine aggregate and two coarse aggregates. The third contains three coarse aggregates and one fine aggregate. "We will demonstrate that we can produce the same strength and improved durability characteristics with less cement than our baseline design," said Browne. Optimized aggregate grading reduces the cost of concrete by $6 to $7 per cubic yard, or about 10 percent. "With optimized grading we can reduce the amount of cement needed from 520 pounds per cubic yard to 450 pounds," said Browne. "And by using fly ash instead of cement we can drop cement demand to 300 pounds. That combination helps us reduce the carbon dioxide produced (during cement production) by more than 40 percent." Another project goal is to find a cheaper alternative for the bond breaker used under the concrete pavement. Standard TxDOT practice calls for a 4-inch (101.6-millimeter) layer of asphalt under the concrete to prevent the base from eroding. That method works well, said Browne, but the cost of liquid asphalt binder has shot up from $2.50 per ton of mixture to $30 per ton. At FM 1938, TxDOT is trying a nonwoven geotextile bond breaker under the concrete. Other states, including Missouri, Ohio and Oklahoma, have tried the innovation with success. The FM 1938 project will be divided into four test sections. The control section will have 4 inches (101.6 millimeters) of asphalt base. A second section will feature the geotextile bond breaker, and the other two will have asphalt bases of 1 inch (25.4 millimeters) and 2 inches (50.8 millimeters), respectively. The performance of the geotextile section will be measured and compared to the asphalt bond breaker sections. TxDOT will use four sections of texturing in the concrete at FM 1938: longitudinal tining spaced at 1 inch (25.4 millimeters), a carpet drag, transverse tining spaced at 0.5 inch (12.7 millimeters) and transverse tining spaced at 1 inch. The goal is to learn which section produces the least tire-pavement noise. "If we can come up with a pavement finish that reduces noise, we may be able to reduce or eliminate the construction of sound walls," said Browne. "That will save a significant sum of money." For more information, contact Wesley Kaisershot of the Federal Highway Administration Texas Division at (512) 536-5957 or wesley.kaisershot@dot.gov. Inno-bits, a new series published by the Federal Highway Administration, provide an overview of proven, readily available design and construction innovations that can improve the way highways and bridges are built. A concrete overlay known as whitetopping can be a cost-effective way to rehabilitate worn asphalt pavements. These short, informative documents focus on innovations that support the Highways for LIFE philosophy of cutting construction congestion and costs while enhancing safety, quality and user satisfaction. They communicate the basic concepts and benefits of these technologies, processes, materials and tools–all of which have been used successfully on U.S. highway projects. They also provide information on where to learn more about each innovation. Construction Analysis for Pavement Rehabilitation Strategies – CA4PRS is a computerized scheduling and traffic analysis tool that helps planners and designers select cost-effective rehabilitation strategies. Design-Build Contracts: Fixed Price – Design-build is a project delivery method in which the design and construction phases of a project are combined in one contract, establishing a finite budget that encourages contractor innovation. Design-Build Contracts: Performance Specifications – Performance specification contracts, which define project results rather than how to achieve them, leverage contractor creativity and increase the opportunity for cost savings. The completed project performs better and enhances service to highway users. Full Road Closure – Temporarily closing a road for reconstruction, rehabilitation or maintenance eliminates the exposure of motorists to work zones and workers to traffic. A full-closure strategy can also cut construction-related congestion, speed construction, improve quality and lower costs. High-Performance Steel Bridges – High-performance steel is structural steel plate that has the optimal balance of strength, weldability, toughness, ductility and corrosion resistance to provide maximum performance in bridges while remaining cost-effective. Innovative Contracting – States are using a variety of new contracting methods to enhance project results and meet cost requirements, including cost-plus-time bidding, design-build, lane rental and warranty contracting. Intelligent Compaction – Installed on compacting equipment, this technology uses a computerized device that provides real-time feedback to ensure accurate, consistent compaction of soil, rock and asphalt surfaces. Intelligent Transportation Systems – These systems use electronic sensing, computer processing and communications equipment to collect, analyze and relay traffic-related information, helping motorists gauge travel time and make necessary driving adjustments. Light Weight Deflectometer – This portable device is a cost-effective tool for rapid field testing of pavement. It determines the strength and stiffness of pavement material by measuring its response under the impact of a load with a known magnitude and dropped from a known height. Movable Barriers in Work Zones – Movable barrier technology allows for quick barrier adjustments, creating protected work spaces or reallocating work zone travel lanes to match changes in traffic flow throughout the day. Prefabricated Bridge Elements and Systems – Built off-site and transported to their final location for quick installation, prefabricated bridge components can speed construction, lessen traffic disruption, improve safety, produce more durable bridges and lower costs. Precast Concrete Pavement Systems – These precast modular concrete panels, formed off-site and installed during off-peak travel times, reduce traffic congestion and enhance safety on projects and produce more durable pavements. Self-Consolidating Concrete – This type of concrete consolidates in complex structural shapes and around congested steel rebars, eliminating the need for mechanical vibration. It reduces time and labor requirements while providing a strong, durable material. Silica Fume in High-Performance Concrete – This admixture, which consists of very fine particles of microsilica, fills the microscopic voids between cement particles to make concrete stronger, more durable and more resistant to chemicals. Self-Propelled Modular Transporters – These computer-controlled platform vehicles can move prefabricated bridge spans weighing several thousand tons and position them accurately within a fraction of an inch, minimizing on-site construction time and traffic disruption. Whitetopping – This technology offers a cost-effective alternative for rehabilitating deteriorated asphalt pavements. It consists of a concrete overlay on existing distressed and rutted asphalt pavement. Work Zone Safety and Traffic Flow Initiatives – These techniques focus on reducing the number and duration of work zones, the number of travelers affected by work zones and the severity of hazards to drivers in work zones. The use of innovative contracting and construction techniques and performance goals helped the Georgia Department of Transportation save nearly $2 million and more than a year on construction time when it built a new interstate highway interchange. The project was the state's first to use the design-build contracting method, which involves contracting both design and construction to a single builder to save money and time. Other firsts included the use of prefabricated elements to build the bridge substructure and real-time traffic operations support through speed band monitoring, according to I-85 Interchange Design-Build Project Using Prefabricated Bridge Elements in West Point, GA, a Federal Highway Administration report on the 2008 project. The $4.43 million project, which received a Highways for LIFE grant, involved construction of a new interchange to provide access to a major manufacturing plant. FHWA's follow-up study on the project found that "overall, the bridge construction went smoothly, resulting in a quality project completed ahead of schedule and in nearly half the time needed for conventional construction methods." Before construction began, the Georgia DOT set performance goals—or desired project outcomes—for safety, congestion, quality and user satisfaction. They were based on the Highways for LIFE program goals, which are set at a level that represents the best of what the highway community can do, not just the average of what has been done. The use of enhanced safety features—including real-time monitoring of traffic speeds through the construction zone—helped the Georgia DOT exceed the goals for motorist and worker safety. Only one motorist incident occurred in the I-85 construction zone, resulting in minor vehicle damage but no personal injury. No worker injuries were reported during construction. Worker on the Georgia Highways for LIFE project uses a template to check the alignment of prefabricated bridge columns. The agency came close to meeting the Highways for LIFE performance goal of reducing the length of time construction affects highway users by 50 percent. The innovative construction and contracting approach cut construction time to 16.5 months, compared to the estimated 30 months it would have taken for conventional bridge construction using cast-in-place technology and traditional contracting methods. During construction, traffic speeds were checked with real-time speed band monitoring, which kept trip times through the work zone to a minimum. Conventional construction would have caused a 25 percent increase in trip time, well over the Highways for LIFE limit of 10 percent. Minimal traffic backups occurred during construction, but none exceeded the 0.5-mile maximum queue length or 20 percent drop below the posted travel speed specified by the Highways for LIFE program goals. The tire-pavement noise and smoothness quality measurements for the completed interchange were higher than the Highways for LIFE program goals, but that's not surprising because those goals were set for pavement surfaces, not bridges. A user satisfaction survey showed that 91 percent of respondents were very to somewhat satisfied with the new I-85 interchange, exceeding the Highways for LIFE goal of 80 percent. A communication program implemented as part of the project provided the public with construction information through news releases, direct mailings and a project website. Survey respondents who received mailings were more likely to have a positive response to the post-project satisfaction survey. Using design-build and other innovative techniques to accelerate construction had a significant impact on the project's overall cost. An economic analysis including both construction and user costs showed that the project saved about $1.98 million, a 45 percent cost benefit over traditional methods. Construction costs under traditional delivery and construction methods were estimated at $672,716 more than the project as it was built. Delivering the project in just 16.5 months saved I-85 users $549,180 in delay costs and $756,242 in safety costs. For the full report on the Georgia Highways for LIFE project, go to www.fhwa.dot.gov/hfl/projects/#ga01.